Apart from the unestimable assistance accorded the Committee by the Ministry of Foreign Affairs with regard to obtaining the cooperation of Dutch diplomatic representatives in numerous instances the Committee had to call in the help of the Ministry to ensure contestants and officials being allowed to enter the country with an Identification Card issued by the Committee, instead of the customary passport. This measure was also approved, and an Identification Card was drafted in consultation with the Ministry of Justice. To be prepared for any difficulties which contestants or officials might encounter at the frontier in spite of all precautionary measures, an arrangement was made with the Inspector of the Royal Marechaussees, as head of the frontier guards to deal with all matters with as little inconvenience as possible to those involved. 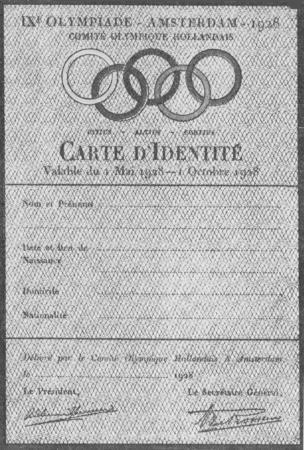 Identification card for contestants and officials, which substituted passports. In connexion with the demands made by the administration of the municipal taxes, which are referred to elsewhere, by which competitors and officials were required to carry identity cards, passport photographs had to be provided for these cards. As many were not in possession of these photos, and had not sent them in beforehand, notwithstanding the fact that the Committee had urged them to do so in several circulars, and had drawn the attention of the attachés to the matter, a great number of tickets were not ready for issue, and had to be prepared in haste, for which purpose an express photographic service was installed in the building. No fewer than 375 photographs were made, or not less than 8% of the total number of tickets distributed, which amounted to 4794. This, of course, caused delay, as the writing out of the tickets, the affixing of the photographs, and the registering cost a good deal of time, even though the required data were at hand in the files. No less delay and extra work was entailed by the frequent alterations in the entries of competitors, which had also caused the Sport-Technical Section so much trouble, which was now repeated, and which rendered much of the work useless. The parking tickets for motor-cars, which were referred to in a previous chapter, were also issued by this bureau, 590 in the first period and 1636 in the second, as well as the tickets for masseurs and trainers, which had been applied for beforehand.